Let’s leave an Earth where our children and grandchildren can all play without worries.” – Yoko Kataoka, a retired baker from Japan. The indefinite hunger strike has been going on for the past 7 days. Some 25 men have been on the fast since May 1 and 302 women and 10 more men have joined the strike on May 4, 2012. More and more women are eager to join the indefinite hunger strike but because of logistical issues such as space, bedding and toilet facilities, we are not in a position to accommodate them all. 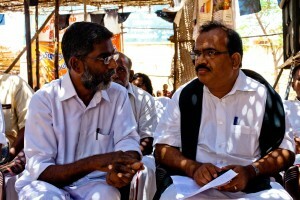 Nanjil Sampath, the propaganda secretary of the MDMK participated in the hunger strike and expressed his party’s support to the struggle. At 3 PM on May 6, 2012, the Struggle Committee, the community elders, women and youth met. After long deliberations and discussions, we decided to return all of our Voter ID cards on May 8, 2012 protesting against the callous attitude of the Government of India and the Government of Tamil Nadu. When they do not respect the hunger strikers’ lives and our people’s interests, we do not want to vote for these selfish and anti-people mainstream politicians and political parties. We intend to return the cards to the Radhapuram Tahsildar (county administrator). We request all our supporters in Tamil Nadu and the rest of India to return their Voter IDs to the local Tahsildar and express their opposition to the governments and show their solidarity with our campaign. Indians living abroad can return their Voter IDs to the Indian embassies in their respective countries. The situation of the women hunger strikers is very grim as many of them are fainting one after the other. A medical team of 3 doctors and 5 nurses came to check the strikers’ health. As the strikers get weaker and weaker, the communities are becoming more and more concerned. But our governments care little as they care more for the interests of Russian, American and French nuclear companies. In the meantime, the political leaders and nuclear officials continue to fool our people. The Central minister at the Prime Minister’s Office said the Koodankulam reactor would be commissioned in 40 days’ time. The Chief Minister of Tamil Nadu has said that power generation will start at Koodankulam reactor 1 within ten days (from May 5th). But the NPCIL officials say that the operation may start much later. Interestingly enough, no one is telling the truth because the capacity factor in the Indian nuclear power plants is only 40 percent. One nuclear official told us personally in a TV debate that it could be 60 percent at Koodankulam. This means Koodankulam reactor 1 will produce only 400-600 MW and not 1,000 MW. And the Tamil Nadu Chief Minister wants all of it from Koodankulam. The Kerala Chief Minister, who did not even know if the Koodankulam reactors had started functioning when we met him a few months back, wants 500 MW. Koodankulam is going to be a big international joke. Our people have been struggling so patiently, peacefully and nonviolently for the past nine months. Our people have not hurt or harmed or killed anybody or damaged any public or private properties. No untoward incident has ever taken place. But neither the central government nor the state government has ever tried to meet our people or listen to their opinions, thoughts, feelings and standpoints about the Koodankulam nuclear power project in a democratic manner. Even now, instead of talking to our people, the authorities are warning us not to turn our movement into a violent one. We are not sure if they are hatching a conspiracy against us. The whole world knows that our people have been struggling nonviolently for the past nine months. When Maoists kidnap MLAs and District Collectors and engage in random acts of violence such as attacking police stations and killing people, the governments nominate high-level mediators, talk to the Maoists in their own hideouts and grant all their wishes and demands then and there. But when our people struggle peacefully and nonviolently, the governments, authorities, politicians, scientists and even some pro-government media houses turn a deaf ear to us. Our helpless and desperate people appeal to the Indian civil society and the international community to come to our rescue as our men and women are becoming weak and tired. We remain open to dialogue with the government officials but we demand a written agreement with a definite action plan and clear timeline. 1.The ongoing work at the Koodankulam Nuclear Power Plant (KKNPP) must be halted and the following steps must be taken immediately. 2.As the Central Information Commission (CIC) has instructed the Department of Atomic Energy (DAE) and the Nuclear Power Corporation of India Ltd. (NPCIL), the Safety Analysis Report and the Site Evaluation Report must be released to the public immediately. And the full and final post-Fukushima safety audit report must also be released to the press and the public. 3.A new and comprehensive Environmental Impact Assessment (EIA) report must be commissioned as the one that the DAE has released after 23 years of struggle is incomplete, erroneous and outdated. The Tamil and Malayalam translations of the new EIA must be shared with the local people and the Press in Tamil Nadu and Kerala. 4.The opinions and preferences of the project-affected people must be heard by a competent authority in an open, transparent and democratic manner to understand the fears and concerns of the people. 5.An independent national committee must be constituted to study the issues of geology, hydrology, oceanography and seismology involved in the Koodankulam nuclear power plant. 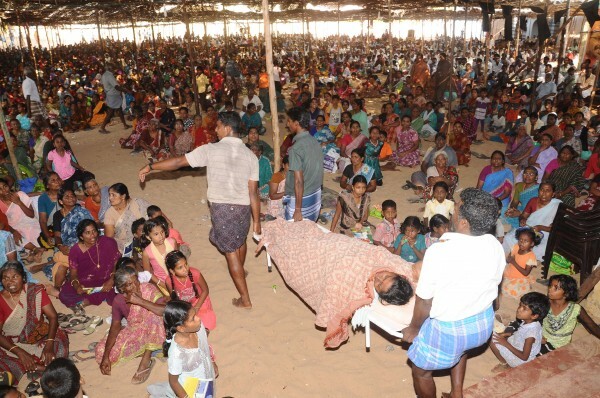 6.Disaster management training and evacuation exercises must be conducted in the 30-km radius of the Koodankulam plants and beyond in the wake of the recent earthquake all over Tamil Nadu and India. 7.A Tamil Nadu State Assembly Resolution must be passed that the Pechipparai dam water from Kanyakumari District and the Tamirabharani river water from Tirunelveli and Thoothukudi Districts will not be taken for the KKNPP reactors. 8.A copy of the Inter-Governmental Agreement (IGA) on liability secretly signed between the governments of India and Russia must be made available to the project-affected public. 9.Complete and truthful information must be given to the local people and the citizens of India about nuclear waste that would be produced at the Koodankulam plants and its management. 10.All the false cases against the members of the struggle committee and the common people must be withdrawn immediately and unconditionally. Our friends who are still languishing in prison, Muhilan and Sathishkumar, must be released immediately. 11.The local people’s right to protest peacefully and nonviolently against the KKNPP and other related issues must be respected and honored. And no more false cases and other intimidatory exercises should be used against the struggling people.